Der Einfluss islamfeindlicher Strömungen und Parteien ist unübersehbar. Er zeigte sich bereits vor 9/11 und der Affäre um die Mohammed-Karikaturen. Doch wo hat diese Entwicklung ihren Ursprung und mit welcher Dynamik hat sie sich verbreitet? Anhand von Fallbeispielen aus Großbritannien, Österreich, Deutschland, Frankreich, Dänemark und den USA zeichnen die Beiträger nach, wie islamophobe Diskurse von den politisch rechten Rändern Eingang in die Mitte der Gesellschaft fanden. Deutlich wird: Medien und Politiker spielen eine entscheidende Rolle in diesem Prozess. Humayun Ansari ist Professor für Islam und Cultural Diversity am Department of History der Universität London. Farid Hafez, Dr. phil., ist wissenschaftlicher Mitarbeiter am Institut für Orientalistik an der Universität Wien. On 29th November 2009 the construction of minarets in Switzerland was banned in a referendum (a majority of 57.5 percent) after Muslims in the town of Langenthal handed in a planning application to build a 30ft minaret to their prayer room. Ironically, this is a town in which a Sikh temple, complete with 'a gleaming white crown' had been inaugurated a year earlier in 2008 without even a squeak of protest! The right-wing anti-minaret campaign used posters depicting a woman wearing a burqa in front of minarets shaped like missiles rising from the Swiss flag. The populist Schweizerische Volkspartei (SVP) cast the minarets as a symbol of political power, a prelude to the introduction of Sharia law. Its leader Ulrich Schluer declared: 'They are symbols of an Islam which wants to establish a legal and social order fundamentally contrary to the liberties guaranteed in our constitution'. Radical feminists argued that the minarets were 'male power symbols' and reminders of Islam's oppression of women. A local housewife said: 'If we give them a minaret, they'll have us wearing burqas [...] Before you know it, we'll have sharia law and women being stoned to death in our streets. We won't be Swiss any more.' Another female campaigner, attacking Muslims who condoned forced marriage, honour killings and the beating of women, warned that the failure to ban minarets would be 'a signal of the state's acceptance of the oppression of women'. A similar battle was reported to be raging in Germany over plans envisaging one of Europe's biggest mosques in the shadow of Cologne cathedral. The Danes were also engaged in a debate over plans for two similarly capacious mosques in Copenhagen. Likewise in the United Kingdom mosques generated anxieties, threats and fears and became sites of political and cultural struggle where values and rights were vigorously contested. In April 2008 Alison Ruoff, a senior member of the General Synod of the Church of England and a former nurse and magistrate, called for the building of mosques to be banned, on the grounds that more construction would lead to Islamic 'no-go' areas dominated by exclusively Muslim populations living under Sharia law. In 2009/10 the controversy surrounding mosque building was ratcheted up still further by the English Defence League, which, with support from the British National Party, successfully exploited the growing popular anti-Muslim sentiment. 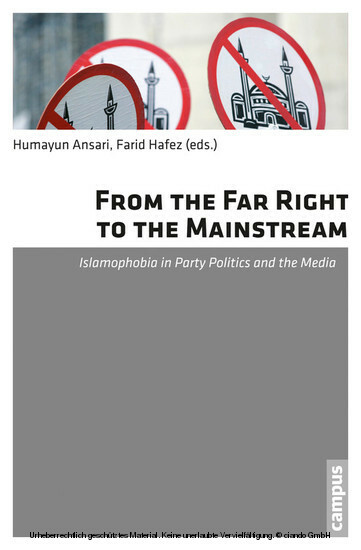 In Harrow, Stoke-on-Trent, Birmingham, Bolton and Manchester, it mobilised significant numbers of disaffected people to mount campaigns generating much vitriol against local Muslim communities. Interestingly, around the same time, amendments to building laws were made in the regional parliaments of two states of Austria-Carinthia and Vorarlberg-with the intention of banning the building of mosques and minarets. The reasoning behind this opposition is interesting to examine. As the 2010 general election approached, Michael Gove, the Conservative MP representing the constituency who, in his provocative book Celsius 7/7, had warned that the West was facing a 'total war' from Islamists, somewhat opportunistically called for the withdrawal of the Bengali Welfare Association's application on the grounds that it had become the target of an 'inflammatory and offensive' online campaign and was threatening 'good community relations'. A British Army source contended: 'There is a real concern that if this thing gets built, then soldiers could be put at risk' (and not only the officers; senior members of the Royal Family including the Queen, who was present at the passing out parade of her grandson Prince Harry, could also be endangered). With two 100ft towers, the £3 million building would have had a clear view over the military academy, just 400 yards from the parade ground-with the media constantly fuelling its image as a source of Muslim violence and terrorism, it was reasonable to imagine the prospective mosque to be a potential security threat.